Next you see strange lights in the sky doing things no plane could do, and start wondering if those little green men are really coming to invade our planet... relax. There are some plain logical explanations for it: for instance... it could simply be a squadron of 49 illuminated quadcopters flying in formation and drawing different images in the night sky. 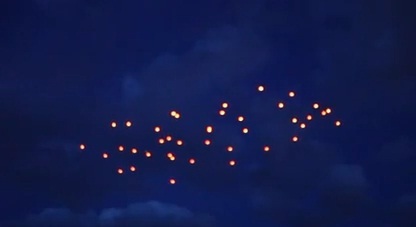 Makes us wonder... if 49 quadcopters can put up such a show, can you imagine what would be possible with hundreds - or thousands - of these aerial drones? Let's hope someone with the right budget might make it real.